The Botanical Garden is located in the historical center of Stellenbosch and is the oldest university botanical garden in South Africa. This compact Garden houses an enormous diversity of plants, both indigenous to South Africa and exotic. The Garden is open to the public and admission fee is R10. Although the collection started in the 1960’s the bonsai and penjing only got a dedicated space in the Botanical Garden in 1972 when the collections of Becky Lucas and later Gerjo van der Merwe were acquired. More recently the bonsai of Louis Nel were put on permanent display in the collection. 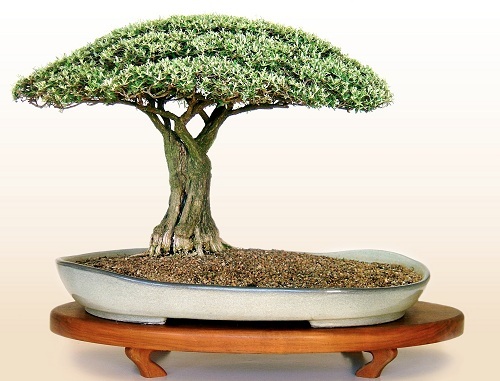 The collection also includes some excellent examples of African bonsai styles such as the flat-crown and baobab styles, as well as a variety of indigenous and exotic tree species, from wild olives (Olea europaea subsp. africana) to the redwood (Sequoia sempervirens). The collection houses some of the oldest bonsai from some of the first South African bonsai enthusiasts. One of the oldest bonsai on display is a pine tree (Pinus sp.) dating from 1940. The Boland Bonsai Kai and their team of volunteers help with the specialist care needed to maintain this bonsai collection. This collection of Oxalis was initiated in 2001, and has grown to currently include about 70% of southern African species. The collection also includes 5 non-South African species, about 10 recently described species, and about another 16 species that are new to science and in the process of being described. It acts as both a reference and research collection, and houses almost all specimens included in the species-level molecular phylogenetic reconstruction of southern African Oxalis. It continues to act as a source collection for morphological and molecular systematic research on the genus. Thus far 8 M.Sc. and 2 Ph.D students made use of this collection, and 19 research papers are linked to plants cultivated in it. An extensive Pelargonium collection was built up by Prof J.J.A. van der Walt during the 1970s to 1990s. This collection formed the basis of his Pelargonium systematic research, and contained most species of the genus recognized at the time. For the more variable species, a number of duplicate accessions were included to reflect this natural variation. The Pelargonium research scaled down dramatically after Prof Van der Walt’s retirement, and the main collection has been dismantled with many plants incorporated into the Garden itself. The Department of Botany and Zoology still maintains an extensive herbarium collection on Pelargonium, and records are maintained in log books and records at the Department.